BACKGROUND Even before the actual demise of the CBS Fitness tennis court, the Bemidji Area Tennis Association (BATA) had been considering options to facilitate indoor tennis. From putting a bubble over some outdoor courts, to converting existing structures, to building new, all have been discussed. In the end it was decided to construct a facility to suit our needs. During the planning period BATA explored partnering with the college, school district, city, county or any entity willing to share our vision. Most were interested, but nothing really fit, until now. 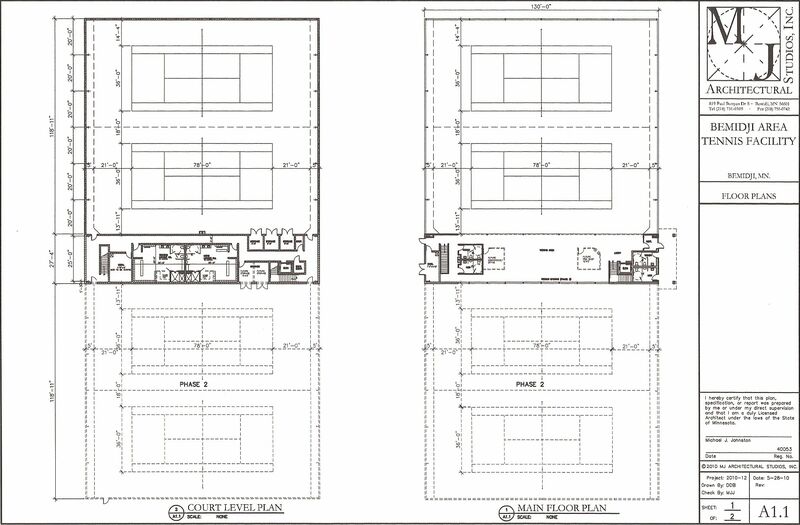 CURRENT STATUS At this point BATA has settled on two courts with full locker rooms and a reception/lobby area. (See Attachment for very preliminary drawings.) 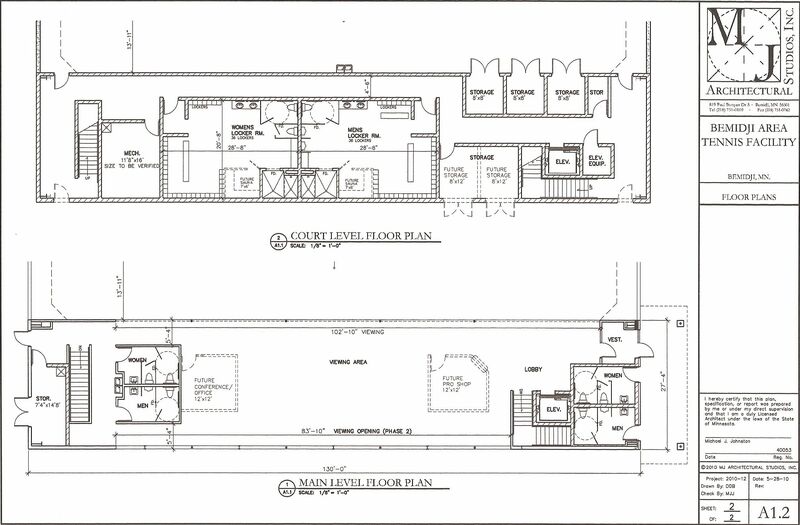 Future plans call for finishing off a second floor viewing area (Phase 2) and adding two more courts (Phase 3) if demand warrants. There are two locations under consideration, either as a component of the city's new 18 acre Ridgeway Park (south of the hospital), or a parcel on 15th street (the first open space west of the water tower). Either property would be a donation to the project. We hope to have a decision on which location in 30 days and commence construction this summer for play beginning in October. NOW THE HARD PART Experience has proven that BATA can utilize court fees to support operations of two courts. What we can't afford is to pay off a mortgage. So the building must be constructed with donated money and labor. If anyone out there has a spare $750,000 our troubles are over. If not, a capital campaign is in our future. The BATA Board is convinced that between private foundations, government grants, corporate sponsorships, and individual donations we can reach our goal. But in reality the majority of funding will likely come from individual participation. We are a 501(C3) non-profit corporation and contributions are tax deductible. FUNDRAISING No board member has the expertise or inclination to attempt an effort of this magnitude and we are considering a contract for professional assistance. However, if anyone reading this email has any interest in leading or assisting in a fundraising campaign, please let one of us know. IMMEDIATE ACTION In order for the Board to proceed we need to gauge the level of community support. Please REPLY to this email by May 5th if you are willing to contribute to the project. Follow up contacts will be made once a formal capital campaign is launched. If you feel compelled to offer a pledge at this point we would certainly appreciate the gesture. That's it for now. If you have any questions, do not hesitate to contact one of the individuals listed below. We want to do this right and welcome all comments and suggestions. Thank you.